For homeowners fortunate enough to have a guest room, design strategies that seem to work for one room doesn’t work for this type of room. Guest rooms should be decorated with your traveling guests in mind (traveling being the keyword here). Think about what you would want if you were a traveler staying in a room. What would be your wants and needs? Consider them as you decorate your guest room, and ensure that your guests love every moment of their stay. First thing’s first: be sure the bed your guests will be sleeping on is actually comfortable! It’s perhaps the most important guest room design tip because all other aspects of design depend on it. If the bed isn’t comfortable, your guests won’t enjoy their stay (and that’s the goal of designing a guest room). Opt for a premium mattress, sheets, bedspread, and pillows to give your guests the best rest possible. Stop by our showroom, and we will find the perfect combination for the room! Your guests are going to need a place to charge their devices, place their glasses, and other essentials. They may also be unable to sleep and want to read or occupy themselves while their partner gets some much-needed rest, so accommodate them accordingly. Plus, it’s a classic look that never goes out of style. For an added look, tuck a desk in a corner and place a desk lamp for a smart look staying guests will appreciate. In other words, think about what would make you feel more comfortable in a guest room. Design isn’t just about the look of a room: the function is just as important. 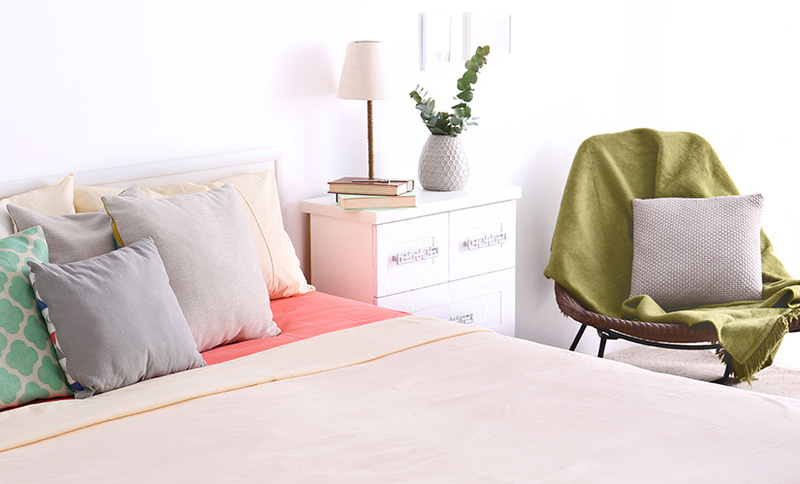 Provide simple, convenient touches that will make your guest room feel more at home. Include a television and sit it atop an attractive entertainment centre/television stand Be sure to sign into streaming services/hook up the cable (speaking of sign-ins, include your Wi-Fi password on the nightstand so they don’t feel awkward asking for it). Further, consider adding little relaxants, such as lotions, bottled water, toothbrushes, and the like. A few little conveniences can go a long way to helping your guests relax! Especially if the room is a shade of white, be sure to implement colourful accents that will really make the room pop. This can be as simple as placing fresh flowers on a desk or throw pillows on a daybed to as unique as a lava lamp on a nightstand or a bright pink throw rug in the middle of the floor. When taking into consideration the types of colours to implement into your guest room, design it without being afraid to use bolder, brighter colours when decorating: experiment with different colours and accents, and give your guests a room to stay in they won’t soon forget!